Great news! We just found out that we won both Best Short Film and Best Actor (for Bill Paterson) and the Staten Island, New York Film Festival. That, along with the PGA Award from last Sunday night, takes us past 30 international awards. Wow! So I promised I would do a round up of the HD cameras that were tested and the results premiered at the PGA conference. So here’s how it was done. Eight of the top cameras, and one 35mm film camera, shot a number of scenes that were fundamentally the same. They were setup, lit and operated by top Hollywood camera teams and the technical levels were world class. The presentation in the theatre (a mix of 2k projected clips and powerpoint) was nearly two hours, and at times a little techy. Of course it was all geared toward large budget productions and so I will refocus their findings for lower budget indie films. OK, so the cameras were…The Arri D21, the Panasonic AJ-HPX3700 (Vericam), the Panavision Genesis, the RED One, the Sony F23, the Sony F35, the Thomson Viper and as a control, on 35mm film, the Arri 435 shooting Kodak 250T 5217. The tests were a series of interior and exterior shots, with actors of different ethnicity, different hair colours, wearing different coloured clothes and doing a mix of activities, all filmed in different lighting setups (ranging from harsh daylight to a single tungsten bulb). 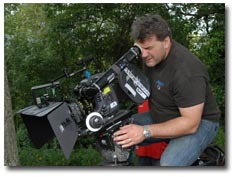 The shots were all taken through post and mastered at 2K, the format in which the shots were also presented. To the untrained eye, all the cameras would look like film, that is for sure. To my eye, by no means a DP’s eye, but certainly someone who undertstands the basics, I was impressed at how good all these cameras looked in all the different lighting conditions. However, there were some weaker cameras – the Panasonic AJ-HPX3700 (Vericam) displayed video like effects on one shot (which included high contrast pyros), and the Red One camera did look ‘mushier’ and more processed than the other cameras on the whole (sometimes loosing considerable detail). To my eye, both the Panasonic and Red were the weakest cameras, followed by the Viper and Genesis (which are older cameras too). 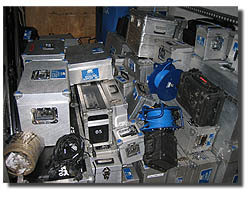 The Sony cameras came out well and at the top of the pile for me was the Arri D21. Now I must stress, I was not making notes in the dark, and it all played onscreen in rapid fire, so this is a very generalised view. I noticed certain things that bothered me, while the DP's present noticed other things that bothered them, but which I was not so concerned about. I guess though, all eyes from the indie community are on RED ONE - Is it good enough for a low budget feature? From what I saw, heck yes! Compared to anything that was cost effective just three years ago, it's mind blowing. So let's put it another way. It's at the bottom of the pile, but that pile is the top tools available, and as such, ideal for cash strapped film makers. Would I buy one? No. Would I rent one? No, I would rent a better camera and work hard to get the same or better deal. Would I use it if it came to it? Absolutely. Apparently there is going to be an article in The American Cinematographer magazine soon, so I am sure it will all be there in incredible detail. 1. One of the camera teams lost a shot due to operator error – it was accidentally deleted, which serves to highlight just how essential data management on a digital (non tape) format can be. This also happened on two other productions I know of in the UK. So it’s a REAL problem and you must take care. When you move data from the camera to a backup system, you MUST have someone qualified to check that it actually has copied as expected and is secure. 2. One DP commented at how long it took to setup the cameras and get everything right. Especially when compared to film, where he was ready to shoot in just a few minutes after whipping out his light meter and assessing the situation. Part of this problem is due to experience with the new formats and cameras for sure, but digital can certainly be more ‘fiddly’. 3. Digital setups generally needed a ‘tent’ for all the kit. This would be an added burden for a low budget film (though you may just wing it of course). 4. The Arri D21 has an optical eye piece (the others having electronic eyepieces) which meant that setup and line up could begin before the camera was even powered on. There were some comments that this could save time on set. 5. There was a great deal of conversation about embedding ‘metadata’ into the files so that along with the pictures, the camera would also record things like GPS position, F-Stop, type of lens, circle takes, even continuity notes etc. This seems like a great idea and will probably happen soon. 6. Using inexperienced crew could be catastrophic, and every camera had different crews working in different ways. This made switching from one camera to another a problem. 7. It appeared that you could mix formats, shooting film and HD and different cameras. Of course, you MUST make sure post will work for this. 8. Planning post production BEFORE shooting is now SUPER ESSENTIAL. 9. 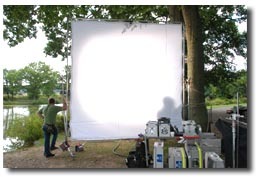 Shooting camera tests is also essential, though for low budget films this may not be practical. I am sure there were many more great points that I missed too! For me I was left with 2 thoughts though. Fundamentally, YES, I would be happy to shoot any of these formats, though if it were the Panasonic or Red, I would work very hard to try and shoot one of the other formats first. I would always seek the Arri D21 first. If Red were the only choice, that would probaly be OK in many circumstances. The Panasonic did look too electronic at times though and I would try to avoid. BUT… I would also still consider film, especially if the numbers worked. Of course some projects would be suited to digital formats, anything effects heavy for instance, but for many projects, film still seems to be a viable choice, at least in early 2009. The D21 has per-pixel noise, whereas the Red has has a double layer of softer noise (smaller monochromatic noise, with larger and softer red/ blue noise on top). The Red's noise seems more like film's than the D21's. isn't good. I've not see the same thing on the Red, but I've not seen it not happening too... So I can't really speak for that one. From a VFX point of view, on the films I've done in the past year, I'd actually prefer to receive Red footage (as long as it's been treated properly in post) over and above D21 footage. That said, as you mentioned at the start, they're all pretty close together, and they're all very very good at what they do. 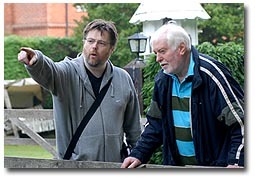 I spent most of yesterday planning the 1 day course that the £100 ‘Gone Fishing’ contributors will receive, some time in January 2008. I have also been cutting a trailer which I plan to put up on the site in the next few days. I have decided to make the course a kind of chronology of events, as I think the most valuable part of it will be about story development, in prep, on set and in post. How the narrative morphs, becomes more subtle and fine tuned. Also, how on set problems are overcome and fixed in pickup shoots or in script rewrites during post - what can be dropped for pace or subtlety in the edit for instance. This narrative development will also be mirrored by production development, how things get bigger and better, but also how the production department deals with that. I am also hoping to have a series of camera tests, including Super 16mm, 35mm, HDV, DVCProHD and HDCam so we can all judge for ourselves just how the formats stand up to one another. These would include things like, stay away from the video monitor, or switch it off. At one point, I noticed we had a 70kw generator driving one video monitor! I had them switch off the generator immediately at sat next to the camera to be with the actors. They appreciated that intimacy and it shows on screen. Another thing is about well planned and executed pickup shoots with a minimal crew. It works wonders with the edit, and is achieved for very little investment in time and money. Work with the best people you can find. DP Vernon Layton made our film look a million dollars. I promise, when you see it, you will be amazed at just how beautiful it looks. Editor Eddie Hamilton cut the film beautifully and has overseen all technical post production, freeing me to get on with other stuff. You can read more details about the course here, and if you know anyone who wants to sign up now, they will get an Associate Producer credit too. I spent yesterday driving a van around London collecting camera kit and lights – I love that moment when normal life ends and you step into the world of movies – that for me was yesterday when I collected the van. Cameraman Steve Brooke Smith camera along for the ride, and thank god he did as there were lots of little niggles to iron our that I would have missed, not least not having a tripod head! We got that fixed though. It’s now nearly 6am. I have had my shower and am about to leave. We plan to be shooting by nine! Hoorah! 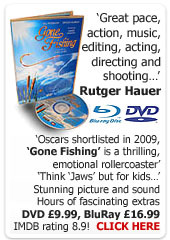 Gone Fishing looks absolutely amazing. In large part this is down to Vernon’s photography and his insistence that we wait on the sun. We were very lucky in the main shoot and managed to shot mostly in bright sunshine, which Vernon then filled the harsh shadows with a whopping great 15k light and bounce boards. We were supposed to be shooting pickup shots today but we moved the dates on Monday as the BBC weather site predicted cloud and rain. Now it’s looking like Friday or Saturday will be the pickup days. I now begin each day with the ritual of logging onto the BBC weather site and checking out the five day forecast for Dorking, the location where we are shooting. It’s important that we get the sun otherwise it will be hard to get shots to match. 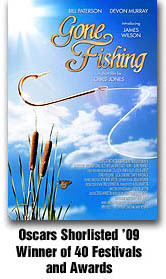 You can view a clip here from Gone Fishing, the first one is without the sun, the second is with the sun (there were clouds when filming - This clip is ungraded and low contrast as it has come straight from the 35mm neg). You can see just how much difference it makes. Amazing really.